If you have a pool at home, you may wonder what the right age is for your kids to start swimming lessons so they can enjoy the water and be safe. The answer depends on how old your kids are and what you mean by swimming lessons. The American Academy of Pediatrics recommends swimming lessons for all children age 4 or older. They used to recommend that you not begin formal swimming lessons until kids are at least 4 years old, the age that children are thought to be "developmentally ready" for swim lessons. However, they are no longer opposed to aquatic programs and swimming lessons for toddlers and preschoolers between the ages of 1 to 4 years old. Keep in the mind that the AAP is not going out of its way to say children under age 4 should have lessons, but it is okay if parents want to enroll their kids in these programs. Infant and toddler aquatic programs are very popular for both parents and kids. They are a good way to teach your kids to enjoy being in the water and teach kids and parents about how to be safe around the water. However, these types of programs may not decrease your child's risk of drowning and are not a substitute for adult supervision and safety in the water, although some small studies have found that "some drowning prevention skills can be learned" by these younger children. Will starting swim lessons early help your child learn to swim faster? Probably not. An older study on children's readiness for learning front crawl swimming showed that whether kids started lessons at 2, 3 or 4 years of age, they learned to swim well at approximately the same mean age of 5 1/2 years. The AAP notes that drowning is a leading cause of unintentional injury and death in the pediatric age group and that drowning rates are the highest among children ages 1 through 2 years. Whether you start at 2 or 4 or 6 years, your child should eventually learn to swim. Keep safety in mind at all times. Remember that swim lessons do not drown-proof younger kids and that they should always be supervised in the water, whether or not they know how to swim. 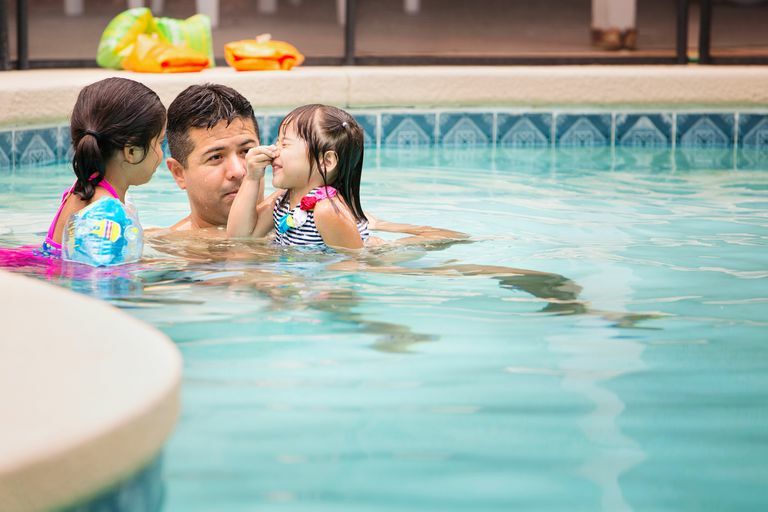 Even with floaties or a life vest, you should learn to practice "touch supervision," which the AAP describes as a caregiver being within an arm's reach or able to touch the swimmer at all times. You should also take other precautions, including instructing babysitters on pool hazards and showing them how to use protective devices. When you have a social gathering around the pool, have the adults take turns being the dedicated watcher so you ensure there are eyes on the kids at all times. Whenever a child is suddenly missing, check the pool first. Learn CPR (cardiopulmonary resuscitation) and ensure all family members do as well. Don't let your pool attract children when it isn't in use and remove toys from around it. Ensure the gate or pool barrier is never propped open. American Academy of Pediatrics Policy Statement. Prevention of Drowning. Pediatrics. Jul 2010, 126 (1) 178-185. American Academy of Pediatrics Technical Report. Prevention of Drowning. Pediatrics. Jul 2010, 126 (1) e253-e262. How Can You Keep Your Kids Safe and Avoid Germs in Swimming Pools?